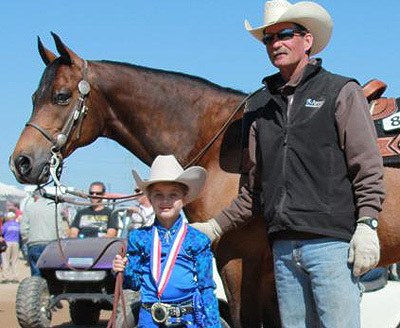 John O’Hara won the Open Reining Futurity on TA Mozart, for the second year in a row! TA Mozart is owned by Kimberly Tillman, and now has earnings of over $39,100! Congratulations to Cori Vokoun on her multiple titles! Showing her gelding Premium Buckshot, pictured above, Cori won the Non Pro Reining Purebred Derby and $7,500! This duo also won the Purebred Reining 18-44 AAOTR Championship. Cork also showed Buckshots Lady Luck to the Half Arab Reining 18-44 AAOTR Championship and Dunits Finest to the Half Arab Reining 18-44 AAOTR Reserve Championship. Kimberly Tillman & FR Scarlet Ohara win the Limited & Intermediate Non Pro Half Arab Derbies! The duo also placed 3rd in the Non Pro Derby. Congrats to Regan Vokoun on winning the Lead Line Championship!